Do you think you are ready? This type of question should make you think about all the things you want to accomplish, but don’t have a clue how to do it! It usually starts with the statement, I wish…….. What is the next step? 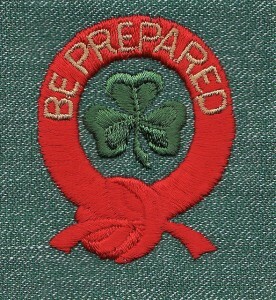 “Be prepared.” That is the motto for the Boy Scouts. “Be prepared for what?” someone asked Baden-Powell, the founder of scouting. “Why, for any old thing,” said Baden-Powell. He was not thinking of being ready for emergencies, although scouts learn lifesaving techniques, first aid and swimming. Scouts learn how to be productive citizens prepared for life’s challenges. Scouting trains youth in responsible citizenship, character development and self-reliance through participation in a wide range of outdoor activities, educational programs and career-oriented programs in partnership with community organizations. If you were not in scouting, what do you do? Education, training, skills and experience are some of the things you will find useful! If you were going to run the marathon, how would you prepare yourself? If you did not know, you would find out! Right? A marathon is 26.2 miles and requires a lot of training to prepare you for such a long run. It takes months of training to prepare to run just ten (10) mile, then building to twenty (20) miles before you are ready for a marathon. Recently, someone won $312 Mega Million lottery! Do you think the winner was prepared? Do they have a college degree? Did they take specialized training or have the knowledge and experience to handle the responsibility of that much money? Probably not! Most winners are ill prepared, lose or spend all of it very quickly and end up exactly where they started. Why? Lack of preparation is most of the reason, but not all of it. The people around them, friends, relatives and spouses take or are given a lot of the winnings. The winners gamble, spend, waste, even give it away or they hire the wrong people. Every successful athlete, entertainer, executive or entrepreneur prepares, trains, and practices before a game, show, or running a business. Do you think Tiger Woods and Michael Jordan were born great? Maybe, but they trained and practiced to be great! All that training prepares you for success, building confidence and developing positive habits. They practiced the skills to be a better at their profession. What are the important skills for any of these professions? Think about the specific skills you need to accomplish and how could you be better? So you are practicing skills that you think will prepare you for success! Did you set up goals? If I wanted to improve my writing, I could increase my reading and practice writing. The next step would be to read a book a week and spend two (2) hours week writing. The last part of my goal is to set up a time frame. Presuming I read a book a week and wrote two hours a week for six (6) months to a year, I would expect that my writing would improve. Set specific, measurable, attainable, realistic and timely (SMART) goals. Break down the goals into daily tasks, monitor results weekly and adjust your efforts to meet your goals. This will prepare you for success. What is your strategy? How do you figure out what is your goal or what skills you need to improve so you are prepared for success? Take the time to find the skills you need to reach your goal. If you want to be a more successful investor, you must take the time to learn about the stock, real estate, or collectible markets. Learning about something you are interested in should be fun. If you don’t enjoy it, you should rethink your goal! Find out what skills you need, set up goals, and make it happen! What are you going to do? I’m a decent dad, but not a great dad! I wish I were more prepared to be a great dad from the beginning. Even though my kids are still pretty young, I missed opportunities to do it better than I had. I don’t know if anyone is really prepared for parenthood. Parenting is a work in progress, find your opportunities to make an impact. Thank you, I made it a priority to have a good relationship with my children. You are the sum of your experiences, learn all you can! Quite honestly my new personal finance blog is preparing me to handle my finances better…and more specifically joining the network of Yakezie members gives me a better handle on personal finance than i would ever have on my own. I routinely surf their blogs daily and find out things that I never would have discovered otherwise. Learning is part of preparation too. Learn as much as you can and then figure out what you want to use for yourself. It is part of the journey. I feel like this newest millionaire may be pretty prepared since they haven’t even come forward yet. If they were smart, they would hire an attorney and an accountant and setup a proper trust for the funds…we’ll see! I think the biggest skill needed is a bit of courage. Even if you don’t know something, if you can jump in and try it, and are willing to learn, you can succeed. Think back when you were much younger, when you tried things and learned along the way. If you are interested in something, you will learn the skills necessary for your interests. It is still true as an adult. Assemble your team of accountant, lawyer, and banker, so you will be ready! You may not use them yet, but develop the relationship.